Here is a map displays territory of Russia. 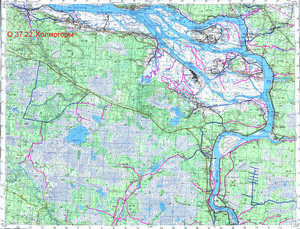 topographic map of Kholmogory for gps. actual map of Lukovetskiy presented. map of Zaruchey 1 cm to 1 km this. topographic map of Zaruchey 1 cm to 1 km for gps. map of Zapol'ye with gps calibration here. free map of Yeliseyevskaya with gps calibration free download. map of Voronovskoye calibrated download for free. detailed map of Volkovo и OziExplorer calibration for Garmin. map of Vlas'yevskoye with gps calibration free download. detailed map of Vavchuga и OziExplorer calibration presented. detailed map of Ust'-Pinega here. actual map of Srednepogostskaya with gps calibration free download. actual map of Setigory и OziExplorer calibration for you. free map of Rembuyevo 1 cm to 1 km here. detailed map of Potashevskaya for gps. map of Pogost 1 cm to 1 km free download. detailed map of Orletsy 1 cm to 1 km for gps.